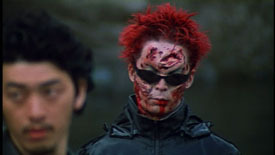 There’s little doubt that Versus is the finest martial arts/superhero/zombie/fantasy epic I have ever seen — and the fact that it is the only such film I’ve seen should in no way be seen as diminishing its level of awesome. 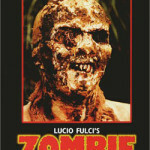 Innovative camera work, awesome fight and effects sequences, an epic fantasy story, gallons of blood, references of everything from Evil Dead to Star Wars to fighting video games, a little bit of love story, a bizarre ending, lots of zombies that are slow and stupid but not above using a gun (poorly) given the opportunity — is there anything this film is missing? It’s the story of a dark hero, his girl, his brother and the shared destiny of all three of them in a forest that brings the dead back to life and serves as a portal to the world beyond death. A dude’s head gets kicked off. Another guy gets his head punched through. A heart gets ripped out and eaten. Bullet opera, wire fu, and lots of stylish clothes. I’m a little awe struck — a friend told me I’d want to watch it again immediately following my first viewing, and you know what? He was totally right. It’s a little long, at two hours, but honestly, I was never bored or restless. I’ve sat through 75 minutes features that felt twice as long — every minute of this was crammed to capacity with awesome. Can the rest of Japan week possibly live up to this? If I had known, I’d have ended with it instead. We watch Attack Girls Swim Team vs. the Undead next — the title is promising at least! A great flick, right up there with Ichi The Killer and Battle Royale. Heard good things about both of those, but I’m so wrapped up in zombies I haven;t had much time for anything else. I love Japanese movies of almost any genre, though, so I will get around to them. Watched this one last night. I thought that the first hour was much better than the second hour. The 2nd half gets a little bogged down in its own mythology and really forgets about zombies for the most part.